Searching for the best roofing nailer is a tough job. If you are on the fence about buying a roofing nailer, and lots of options are baffling you, keep on reading. We are going to review the best roofing nailers on the market and reveal their pros & cons. A roofing nailer is a kind of tool that assists in driving nails into wood or some other type of material; it can also be used for a variety of tasks, such as framing and roofing. Due to its ease of use and speed, it has become immensely popular. People from all walks of life opt for it when it comes to shooting nails into a wide range of materials. 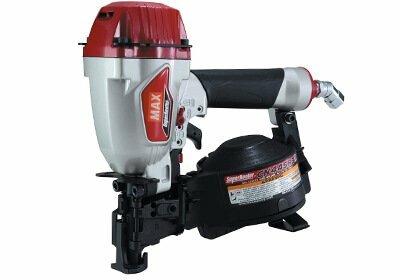 If you also need a roofing nailer for your next project but don't have an idea what model do you need, here is the list of best six roofing nailers in the market. We have spent hundreds of hours in researching, analyzing, and testing their features. Therefore, you can trust us. Get the job done faster. We also assessed their little features that can have a significant impact on work performance. For example, Trigger, Dept-of-Drive, Anti-Dry Firing, Power Source, and Durability. 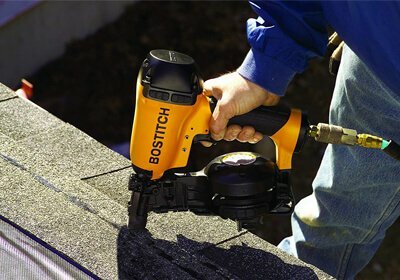 When it comes to making your roofing projects easier, BOSTITCH RN46-1 is the talk of the town. And, this is mainly because it offers a single action canister. It is a premium feature that assists in fast, one-step nail loading. Apart from introducing single canister action, it appears that the professional manufacturers of BOSTITC have focused on the dry firing issues as well. Since dry firing causes the nailer to get damage. They have introduced 'Zero Nail Lockout' that controls this problem. It ensures that the nailer doesn't fire once empty. In other words, the BOSTITCH RN46-1 locks itself after the last fire. If you are opting for a roofing nailer first time, you won't experience any trouble in using it, as it is durable and lightweight. The BOSTITCH Company has used magnesium housing that adds years of life into it. Besides, people who aren't able to use heavy tools, especially women, they will fall in love with it; it is light enough to handle demanding jobs. Even for professionals, it is quite impressive. It delivers 410 inch/lbs of force at up to 100 psi. In a way, you can drive up to an impressive 100 nails per minute. Lightweight magnesium housing for job site durability. 'Zero Nail Lockout' feature to avoid dry firing. Over-molded grip for unmatched grip and comfort. The high capacity magazine can hold 120 coil nails. You can set nails to desire depths quickly & conveniently. 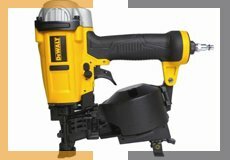 It is a newly-launched product from DEWALT Company. Because of its million-dollar features, it makes professional jobs a lot easier. 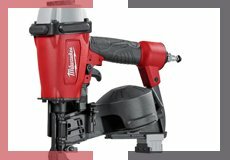 Before reviewing this roofing nailer, we have contacted a professional builder who has 25 years of experience, as he'd this product. According to him, this product is his favorite tool, precisely because of its safety and speed. These two things are always the primary objectives of this kind of tool design. It appears that DEWALT Company polished these two features on a grand scale. Furthermore, it stays well-balanced during hard jobs as well. Now, the question is, how does this happen? Well, the compact body & design of DEWALT DWFP12658 support these views. The body is exclusively designed to give higher control and balance. There are skid-resistant wear guards/pads that provide complete control and safety. They give you the kind of smooth power that you have been seeking in a roofing nailer. Other than that, there is a selectable trigger too. It is easy to select between single sequential action and bump action mode. Though, bear in mind, when the product arrives, in the default setting mode, this nailer is already set on a single sequential action mode. It is easy to change it, but you can find clear instructions in the owner's manual. It can accommodate 120 nails at one time. Low weight at 4.9 pounds and compact design. Over molded rubber grip for superior comfort. Selectable trigger for contact or sequential drive. 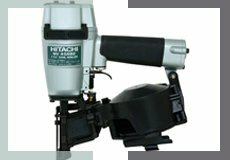 Hitachi NV45AB2 Roofing Nailer is an outstanding product. It is the answer to your all roofing needs. The best thing about this product is it is utterly durable. It provides continuously accurate results over the life of the tool. And, we can expect this feature, as it is from the world-renowned Hitachi Company. 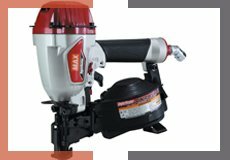 This company only provides professional grade power tools for woodworking and other building related projects. Therefore, for nailing, it is tough to get a better product than NV45AB2. First, let's talk about its design. It is designed for maneuverability. For that reason, it is a lightweight product at just 5.5 pounds. If we say it gives the best one-handed operation, it would be 100% correct. While working on rooftops, it keeps your comfortable and in control. Also, it doesn't slip from your hands either, as the Hitachi Company have use non-slippery rubber grip on it. Even in rainy weathers, you have a firm grip on it. Rubber on the nailer's side also keeps the HV45AB2 in place; it doesn't let it slide off the roof. It is kind of an all-weather nailer you can count on. It has been tested rigorously in extreme roofing environment. It can throw roofing nails from 7/8 inch to 1-3/4 inch. Tool-free depth of drive adjustment. The coil magazine allows 120 nails inside it at a time. Rubber safety valve cover; it provides quite a firm grip too. 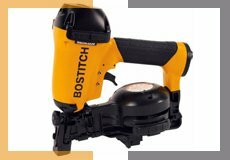 If you are a professional and have already tested BOSTITCH, Hitachi, and et cetera opt for Max CN445R3 Superroofer Roofing Coil Nailer. You will be so pleased with it, we guarantee! The most excellent thing about this product is you can use it all day, and it never gets jammed. You will be super comfortable. Besides, there are some significant updates on this product by Max manufacturers that make it rise to the top of the charts. For example, it drives 15 degrees wire collated roofing nails. This range from 3/4" to 1-3/4" in length. Also, it has a unique tangle-free swivel, which is hard to find in other nails. It assists in working comfortably too. The only con we found in this product is it can dry fire. Perhaps, that's why, most consumers don't choose it, as according to them dry fire damages the entire situation. However, if the depth feature is set accurately, it won't do any damage. Besides, if it dry fires, unlike other models, you will know instantly. You won't experience any malfunction. You won't experience any jamming even after months of use. This product can dry fire, but you will know about it instantly. It has a dial adjustable depth control. It also has a tangle-free swivel plug. Excellent for everyday roofing, and tile board applications. A roofing nailer is a must-have for professionals for a myriad of tasks. And, Ridgid R175RNA 21163 Roofing Nailer exceeds all the expectations. Even professional builders recommend it to the beginners, who don't know much about roofing or roofing nailers. If you are a person who is mainly looking for drive quality, this is for you too. You will be more than satisfied. Since the manufacturers of Ridgid ensured it is driving straight. They perceive it enhances not only the drive quality but also the roof quality. Apart from this, there is replaceable nosepiece with carbide inserts. This feature particularly turns a standard product into an award-winning product by extending its life. Moreover, it makes the entire maintenance process easy too. You don't have to struggle at all while cleaning or polishing. 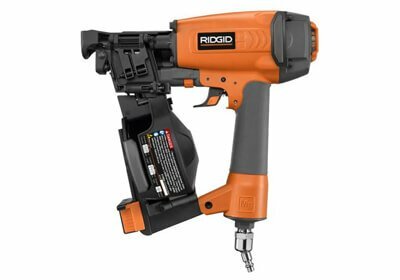 Before you opt for this product, keep in mind that, according to the Ridgid Company, it is designed for power-finish nails. That's why using it for its purpose will give excellent results. 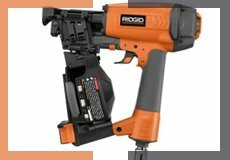 We often see Ridgid R175RNA 21163 Roofing Nailer in the hands of general contractors. This proves that this product always performs. Though, remember that it is a tad heavier than other roofing nailers. It weighs around 10.1 pounds. There is EZ Load feature for quick reloading. Tool-free shingle guide adjustment for shingle replacement. It has a selectable trigger for contact fire. It’s replaceable nosepiece with carbide insert for easy maintenance. It is a tad heavier product than others models. Want to buy something with confidence? 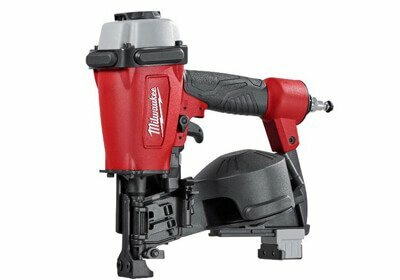 Get MILWAUKEE Coil Roofing Nailer. It is one of the best products in this list. I don't know why it isn't gleaning praises from the market, but in reality, it is an A++ product. The Milwaukee Company should advertise it more to make it red-hot, as it has all the best-selling features that make a customer fall in love. For example, it is an ultra-light model. 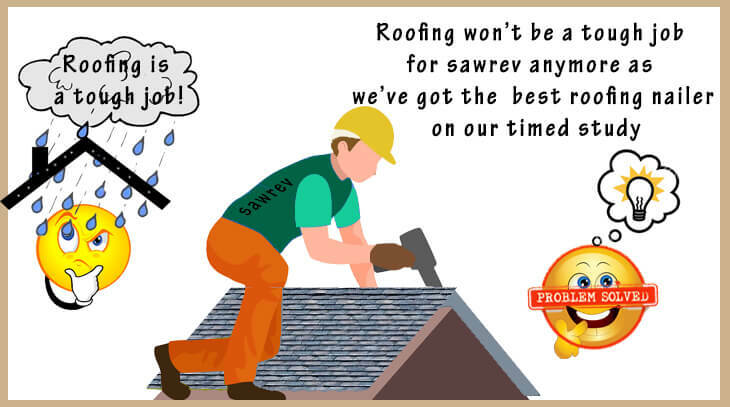 It is for those who consistently deal with roofing projects. The goal is to provide comfort to the professional workers. On top of that, there is magnesium housing that minimizes the fatigue. The overall design is compact too, which offers greater maneuverability. It weighs around only 7.35 pounds with 6.2 X 11.6 X 15.4 dimensions. This is more than enough to comprehend why it deserves the top place in the roofing nailer list. Manufacturers of Milwaukee reduced the noise too on a massive scale. It has an adjustable air deflector that directs the exhaust away. This thing holds down the noise and allows you to work in peace. Though, it doesn't mean it's without sound entirely; it isn't just annoying like many other roofing nailers. All magnesium house to keep it lightweight. Selectable trigger for natural mode selection. Removable shingle guide for quick shingle alignment. Air deflector reduces the noise level. Thick rubber guard reduces housing damage. Without a doubt, roofing nailer is one of the most important tools you can have in your arsenal. However, it is not easy for a beginner to opt for it, as there are lots of highs and lows to understand first. They've to do their homework well to get the best nailer. Yes, they are available in different types. For example, there are siding nailers, flooring nailers, pin nailers, and palm nailers. Though the shape looks almost the same, the purpose is entirely different. 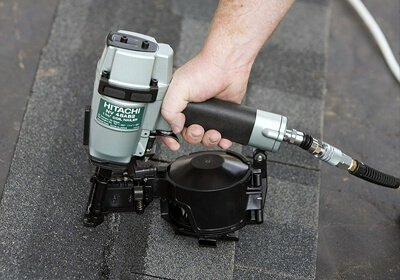 Roofing Nailers are mainly those that attach shingles to houses. Professional companies design them, especially for this specific job. Power source of a nailer also plays a significant role. 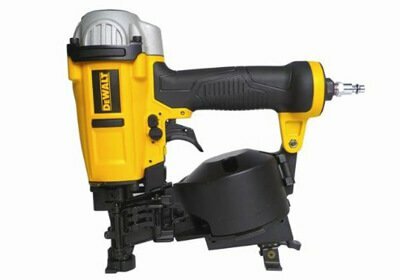 There are battery-powered nailers and fuel-driven nailers. In the battery-powered nailers, you experience a quick start-up time. This delivers greater mobility during large roofing projects. On the other hand, in the fuel-driven nailers, fuel drains from a gas cartridge into a combustion chamber. It makes the nailer capable of driving large fasteners into a hard material. Other than that, this type of power source also usually doesn't have cords or hoses. Roofing nailers have different kinds of firing modes, like single-sequential, Single-actuation, and full-sequential. The single-sequential prevents you from bump firing the nail. The single-actuation bump fires the first nail only. And, in the last category, full-sequential, you must activate the trigger to fire each nail. If a nailer isn't highly accurate, it is good for nothing. Now, of course, almost all the recent nailers offer high accuracy, as they don't hammer nails in a crooked fashion. But, it is still good to know about the accuracy before buying any product. The nail should always precisely go where the tip of the nail is. This improves the quality of craftsmanship. Most companies highlight this feature in their description. In case you don't find it, you can ask them directly, as their customer support team is always there to answer your questions thoroughly and resolve your concerns. ​There are many schools of thought on this subject, as people have their preference. The coil-style magazine holds the nail in long, flexible strips. On the other hand, the stick-style magazine also holds long strips of nails; the only benefit they have is they make the product economical. The coil-style is expensive; it contains a lot more nails too. Nobody wants to be injured when using this tool. You don't want a hole at any place of your body, particularly on your hands. Recent statistics show us more than half of the roofing nailer injuries (on journals and study: 1 2 3) happen to the hand or fingers. For that reason, it is essential for you to follow safety measures. Firstly, and most importantly, make sure you are buying it from a reputable source, and there isn't any fault in it. Second, never lose concentration. Once you lose focus, you put yourself at risk and can get hurt by your roofing nailer. Try to opt for this mode always. Since, even if you lose concentration, it protects you. This trigger works in two steps; you must contact the tip in the shingle and squeeze the trigger as well. In a way, you have to follow these two steps every time to release nail. Workers who use this trigger are less likely to face injuries. There are a few work time safety rules you must follow. Never use the nailer if there is any problem in it or if it is jamming, again and again, don't place your hands or body close to the shooting range, and never point the nailer at anyone. All of these above nailers are perfect for roofing. They are durable with versatile features. If we have to pick any one of among them, we will place our hands on BOSTITCH RN46-1. It lasts longs and provides super accuracy. Furthermore, its lightweight also makes it excellent when you operate for long hours.